Cognitive radio (CR) is widely recognized as a novel approach to improve the spectrum efficiency. However, there exists one problem needed to be resolved urgently, that is the two conflicting goals in CR network: one is to minimize the interference to primary (licensed) system; the other is to maximize the throughput of secondary (unlicensed) system. Meanwhile, the secondary user (SU) has to monitor the spectrum continuously to avoid the interference to primary user (PU), thus the throughput of the secondary system is affected by how often and how long the spectrum sensing is performed. Aiming to balance the two conflicting goals, this article proposes a novel Interference-Constrained Adaptive Simultaneous spectrum Sensing and data Transmission (ICASST) scheme for unslotted CR network, where SUs are not synchronized with PUs. In the ICASST scheme, taking advantage of the statistic information of PU's activities, the data transmission time is adaptively adjusted to avoid the interference peculiar to unslotted CR network; the operation of spectrum sensing is moved to SU receiver from SU transmitter to increase the data transmission time and hence improve the throughput of SU. Simulation results validate the efficiency of ICASST scheme, which significantly increases the throughput of secondary system and decreases the interference to PU simultaneously. Cognitive radio (CR) [1, 2] is one of the most promising and revolutionary technologies to improve the spectrum efficiency by allowing secondary users (SUs) to access the temporarily unoccupied spectrum allocated to primary users (PUs). So far, two kinds of CR network have been discussed: one is the slotted CR network where SUs only needs to detect PUs at some specified moments to learn the accurate state of the spectrum ; the other is the unslotted CR network, where PU may access the channel at any time, e.g., when SU is temporarily transmitting data on the spectrum . Obviously, considering the heterogeneity of primary network and discontinuity of the allocated spectrum, the unslotted CR network model is more realistic but faces more challenges. Thus, this article mainly focus on the unslotted CR network. In the design of CR network, especially for the unslotted CR network, there exist two conflicting goals, namely, to minimize the interference to primary system and to maximize the throughput of secondary system . The aim of this article is to design a novel spectrum sensing and data transmission scheme to strike a good balance between the two conflicting goals for unslotted CR network. As for the interference to PU in the unslotted CR network, it can be classified into two categories: missed-detection interference and unslotted interference. The missed-detection interference is caused by the missed detection in spectrum sensing due to the noise uncertainty and wireless fading channel [6, 7]. The unslotted interference results from the fact that SU cannot precisely predict the time PU accesses the channel again. There has been an extensive research on missed-detection interference, such as decreasing it through cooperative spectrum sensing [8, 9], limiting it by maximizing the throughput or sensing efficiency [10, 11] and so on. However, the research on the unslotted interference is still in its early stage, and existing research mainly includes: Zvaifler et al. 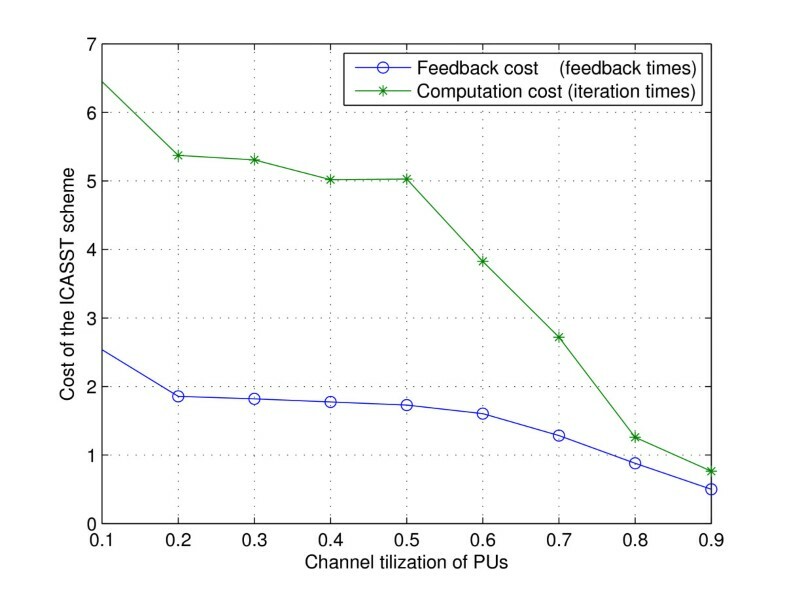 adds a prediction time slot to predict the state of channel in the next time slot; Kohavi  decides whether to sense the channel or to transmit data based on previous sensing results, and Ref  adaptively adjusts the transmission time based on the prior knowledge of PU's activity. Nevertheless, [4, 12, 13] only decrease the unslotted interference and don't take the throughput of secondary system into account and hence don't resolve the two conflicting goals. Hence, this article mainly focuses on simultaneously increasing the throughput and decreasing the unslotted interference. As for the throughput of secondary system, it is affected by how often the spectrum sensing takes place and the durations of spectrum sensing. This is because that SU has to monitor the spectrum continuously to avoid the interference to PU, which inevitably decreases the data transmission time and hence the throughput of secondary system. Generally, the CR system adopts the periodic sensing strategy, as depicted in Figure 1, where each frame consists of one spectrum sensing slot t s and one data transmission slot T p - t s . The length of t s is chosen to maximize the channel utilization , sensing efficiency  or system throughput , while limiting the interference to PU. But [3, 10, 14] still don't get rid of the influence of spectrum sensing on throughput in essence. Although recently  proposes a scheme where the throughput is not influenced by spectrum sensing, it only considers the missed-detection interference and doesn't consider the unslotted interference. Besides, the throughput of secondary system is limited in the scenario where PU reclaims the channel and there is no other idle channel to switch to, and relative research has been done about this scenario. Ref  designs a link maintenance protocol to achieve continuous communication for SU, Refs [17, 18] suggests transmitting data on the channel at a lower transmission power assuming SU always has data to transmit. This article aims to increase the throughput of secondary system by jointly considering the influence of spectrum sensing. Frame structure of the periodic spectrum sensing. To resolve the two conflicting goals in unslotted CR network, this article proposes a novel Interference-Constrained Adaptive Simultaneous spectrum Sensing and data Transmission (ICASST) scheme. 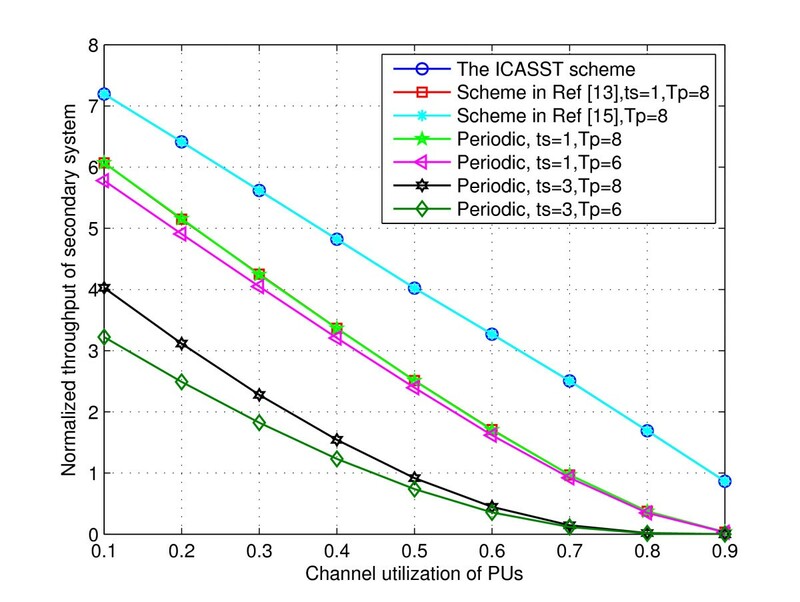 In the ICASST scheme, exploiting the statistic information of PU's activities, the unslotted interference is decreased by adaptively adjusting the data transmission time; the throughput of secondary system is significantly increased by enabling simultaneous spectrum sensing and data transmission. The ICASST scheme consists of two stages: Stage I is designed for the situation where there exists idle channel; Stage II is designed for the scenario where no channel is sensed idle but SU still has data to transmit. In Stage II, SU decides whether to transmit data at a lower power according to the length of SU's queue, where the transmission power is limited by PU's outage probability. The remainder of this article is organized as follows. Section 2 presents the PUs' activity model and the SU's queueing model. Section 3 depicts the frame structure and procedures of ICASST scheme. Sections 4 and 5, respectively, gives the theoretical analysis of Stage I and Stage II of ICASST scheme. The simulation results in Section 6 validate the efficiency of ICASST scheme and evaluate its cost. Finally, this article is concluded in Section 7. In this article, perfect spectrum sensing is assumed based on the following two facts: first, how often and how long the spectrum sensing is performed have bigger influence on the overall performance of CR network than the spectrum sensing algorithms itself; secondly, this article mainly focuses on the unslotted interference rather than the missed-detection interference. Subsequently, the PU's activity model and SU's queueing model are introduced, respectively. where τ ̄ 1 and τ ̄ 0 denote the average sojourn time of ON and OFF state, respectively. In this article, we assume that the CR system adopt a queue to prevent the packet loss and store the unprocessed data temporarily. The queueing system model  is shown in Figure 2, the arrival process is molded as a Poisson process and A(t) represents the amount of arrival data (in bits) over the time interval [0, t), R(t) denotes the amount of the departure data in the time interval [0, t), Q(t) is the length of queue at time t and the buffer size is L bits. To illustrate the ICASST scheme explicitly, first, the related symbols are given in Table 1 then, the frame structure and procedures are shown in Sections 3.1 and 3.2, respectively. Figure 3 demonstrates the frame structure of the proposed ICASST scheme, which is divided into two stages. In ICASST scheme, both of the transmission time in Stage I and Stage II are adaptively adjusted. As illustrated in the bottom of Figure 3, spectrum sensing is performed at SU Rx (receiver), which firstly decodes the data transmitted from SU Tx (transmitter) treating the PU's signal as interference, and then utilizes the remainder of the decoded signal to detect PU's signal. Frame structure of the proposed ICASST scheme. Stage I occurs when SU Rx reports to SU Tx that the channel is idle and SU Tx happens to have data to transmit. According to the prior statistic knowledge of PU's activity, SU Tx firstly estimates the switch point tsp1, and then calculates the adaptive transmission time T 1 i based on the estimated tsp1. Subsequently, SU Tx transmits data within the time interval T 1 i , meanwhile, SU Tx informs SU Rx of the adaptive T 1 i . After that, SU Rx feeds the sensing result back to SU Tx at the end of T 1 i . At last, SU Tx decides whether to continue Stage I or start Stage II in accordance with the sensing result. Stage II is started when current channel is reclaimed by PU but there exists no idle channel to switch to. First, when SU RX informs SU Tx that no idle channel is sensed, SU Tx decides whether to transmit data in the light of the queue's length Q(t). If Q(t) < Qth, then SU Tx transmits data at a lower transmit power P s , which is constrained by PU's outage probability. Furthermore, the transmission time T 2 j is also adaptively adjusted to limit the missed spectrum opportunity, which is defined as the available time interval that is not discovered by the SU. Similarly, SU Tx sends the T 2 j to SU Rx, and SU Rx feeds the sensing result back to SU Tx at the end of T 2 j . According to the sensing result, SU Tx decides whether to continue Stage II or restart Stage I. To make ICASST scheme clearer, the pseudocode of Stages I and II are given in Tables 2 and 3, respectively. In Stage I, the data transmission time is adaptively adjusted subject to the interference time constraint. Here, we assume that the SU Tx know the statistical information of the PU's activity, including the mean, the variance and the PDF of PU's ON and OFF periods. The aim of the adaptive algorithm is to limit the interference time generated in the scenario where the licensed channel switches from OFF state to ON state while SU Tx is transmitting data on the channel. where c1 = t i - tsp1 is the time interval starting from the most recent channel switch point tsp1 to the i th SU transmission. What is worth mentioning is that larger α results in larger interference time I ( T 1 i , c 1 ) , larger transmission time T 1 i and hence larger throughput of secondary system. Therefore, α can be seen as a tradeoff parameter between the interference time and the throughput of secondary system. It is clear from (6), (8), and (9) that the calculation of the adaptive transmission time T 1 , adp i depends on the information of the switch point time tsp1. Thus, it is very important to estimate tsp1 for the proposed ICASST algorithm. Denote t sp 1 ′ and t ^ sp 1 as the old channel switch point and the estimated new channel switch point, respectively, and the real value of the new switch point is tsp1 = t i + s.
where c 1 ′ = t i - t sp 1 ′ is the time interval between the old channel switch point t sp 1 ′ and the i th transmission. The condition to start Stage II is that there is no idle channel and the queue length Q(t) is bigger than the queue length bound Qth. The transmission power P s in Stage II is lower than that in Stage I and is constrained by the outage probability of PU. What's more, the data transmission time T 2 j is also adaptively adjusted with the aim of limiting the missed spectrum opportunity, which is the time interval when PU is inactive but not detected by the SU. When there is no idle channel detected by SU Rx and the queue length Q(t) is larger than the queue length bound Qth, the SU Tx is allowed to transmit data at a lower transmission power under the outage probability constraint in this article. where h p denotes the channel between PU Tx and PU Rx, hsp denotes the channel between SU Tx and PU Rx, B is the bandwidth of the channel, σ n 2 is the variance of noise, P s is the transmission power of SU Tx in Stage II, Ppri is the transmission power of PU, and Rmin is the required minimum transmission rate for PU with outage probability Pout. where σ h sp 2 is the expectation of |hsp|2, i.e., the variance of hsp. where s is the residual time of the PU's OFF state, c 2 = t j ′ - t sp 2 is the time interval between the most recent channel switch point tsp2 and the j th transmission of Stage II. Where β is the prescribed parameter of the missed spectrum opportunity. where c 2 ′ = t j ′ - t sp 2 ′ , and t sp 2 ′ is the old channel switch point. This section includes two parts: Section 6.1 evaluates the performance of ICASST scheme, and Section 6.2 discusses its cost. Numerical simulations are performed to evaluate the proposed ICASST scheme compared with the traditional periodic sensing scheme which is described in Figure 1 and the schemes in  and . Ref  dynamically adjusts the data transmission time but doesn't consider the influence of spectrum sensing on the throughput of secondary system. Ref  avoids the influence of spectrum sensing but it only takes the missed-detection interference into account and doesn't consider the unslotted interference. The ICASST scheme jointly considers the influence of spectrum sensing on the throughput of secondary system and the unslotted interference. The performance metrics used to evaluate the proposed ICASST scheme are the throughput of secondary system and the interference index. The interference index is defined as the ratio of the unslotted interference time to the total simulation time. The simulation results describe the variation trend of throughput and interference index versus the channel utilization u, which is defined in Section 2.1 by (1). The same to , two kinds of distributions for PU's activity are considered in this article: the memoryless one, such as exponential distribution; and the one with memory, e.g., Lognormal distribution and Pareto distribution. 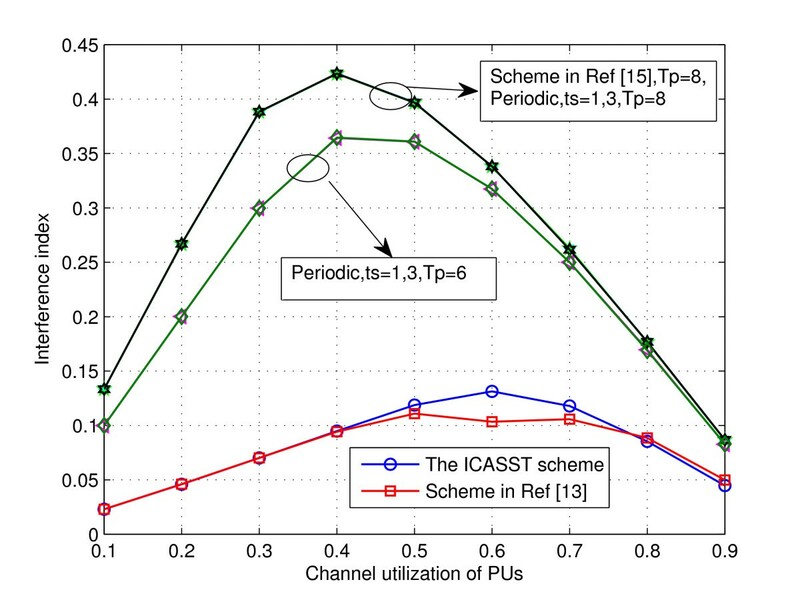 Figures 4 and 5, respectively, exhibits the variation of the throughput of secondary system and interference index against channel utilization when PU's activity follows exponential distribution. Figures 4 and 5 shows that when PU's activity follows exponential distribution, the ICASST scheme converges to the scheme in , while the scheme in  converges to the periodic scheme. This can be explained by the memoryless feature of the exponential distribution, because the information of the previous channel state is not helpful, i.e., the interference time I ( T 1 i , c 1 ) is not related to the time interval c1, where c 1 = t i - tsp1. Throughput of secondary system against channel utilization when PU's activity follows exponential distribution. Interference index against channel utilization when PU's activity follows exponential distribution. For the periodic scheme, it can be concluded form Figure 4 that the throughput of secondary system is more dependent on the spectrum sensing slot t s than the total period T p . This is because that longer sensing time t s results in shorter data transmission time and hence lower throughput. Figure 5 shows that the interference index is only dependent on the total period T p and is irrelevant to the sensing slot t s . This is due to the perfect spectrum sensing assumption in this article. And if it is not perfect spectrum sensing, then larger t s will lead to smaller interference index. What is worth mentioning is that larger T p leads to larger interference index, because larger T p results in bigger possibility of interfering with PU. Figures 6 and 7, respectively, describes the variation of the throughput of secondary system and interference index against channel utilization when PU's activity follows lognormal distribution. 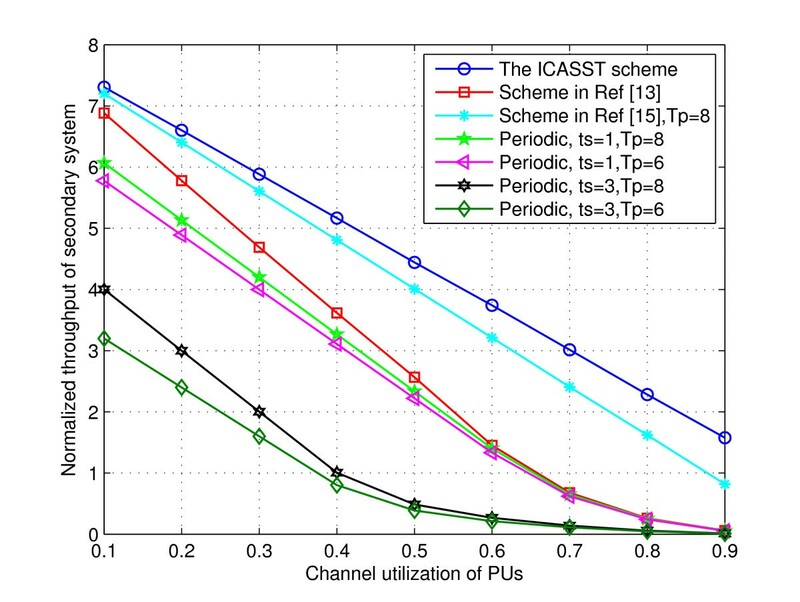 First, the simulation results in Figure 6 prove that the throughput of ICASST scheme is significantly higher than that of periodic sensing scheme. This is mainly because that the data transmission time of ICASST scheme takes a much larger percentage than that of periodic sensing scheme. And because of the same reason, the throughput of the ICASST scheme is also significantly larger than that of the scheme in . Second, the throughput of ICASST scheme is also higher than the scheme in  due to the existence of Stage II in ICASST scheme, which increases the system throughput. Throughput of secondary system against channel utilization when PU's activity follows Lognormal distribution. Interference index against channel utilization when PU's activity follows Lognormal distribution. Figure 7 shows that the interfere index of ICASST scheme is much lower than that of periodic scheme and the scheme in . This is because that the ICASST scheme efficiently reduces the unslotted interference through adaptively adjusting the data transmission time according to the statistic information of PU's activity and the estimated channel switch point. It is noticed that the interference index of ICASST scheme is similar to that of the scheme in , but the throughput of ICASST scheme can be much higher. This result validates the conclusion that the ICASST scheme increases the throughput and decreases the interference simultaneously. 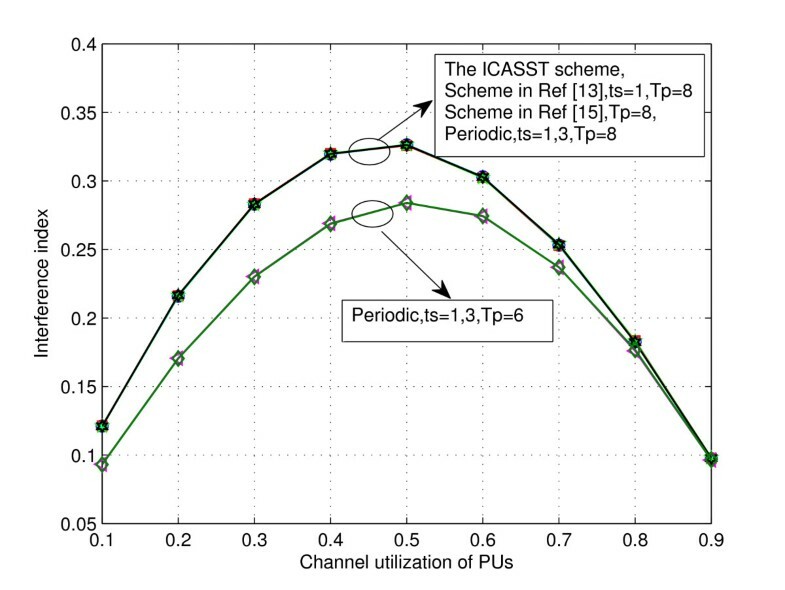 Figures 8 and 9, respectively, depict the variation of the throughput of secondary system and interference index against channel utilization when PU's activity follows Pareto distribution. It is clear that the variation trends in Figures 8 and 9 are similar to those in Figures 6 and 7. That is to say, when PU's activity follows Pareto distribution, the ICASST scheme can also significantly increases the throughput and decreases the interference index compared with existing schemes. Throughput of secondary system against channel utilization when PU's activity follows Pareto distribution. Interference index against channel utilization when PU's activity follows Pareto distribution. Section 6 has evaluated the efficiency of ICASST scheme, and this section will discuss its cost. First, in the ICASST scheme two feedback channels are introduced, one is used to send the transmission time, and the other one is used to feed the spectrum sensing result back. Second, additional computation is needed in ICASST scheme to decrease the unslotted interference. The details about the feedback overhead and computation cost are analyzed in Sections 6.2.1 and 6.2.2. In the ICASST scheme, the adaptive spectrum sensing time in SU Rx is equal to the adaptive data transmission time in SU Tx, and both of them are measured in the minimum time unit. According to the statistic information about the PU's activity, the feedback overhead for adaptive spectrum sensing time is set to be D bits, that is to say, the maximum transmission time or spectrum sensing time is 2 D time units. The feedback overhead for spectrum sensing is only one bit, which equals to one when the channel is in ON state, and equals to zero while the channel is in OFF state. Since the number of the feedback times is relevant to the changes of the channel state in the ICASST scheme, the cost of feedback is further evaluated by the feedback frequency, which is defined as the number of the feedback times over the times of the changes of the channel state. To illustrate the cost of the feedback, the blue line in Figure 10 shows that the average feedback frequency declines from 2.5 to 0.5 when the channel utilization increases from 0.1 to 0.9. That is to say, the feedback frequency is approximately equal to the frequency of the changes of the channel state. Thus, the feedback overhead has little effect on the overall performance of the CR system. Cost of ICASST scheme against the channel utilization. As shown in (8) and (9), to get the adaptive transmission time, an optimization problem has to be resolved first. What's more, the expressions of the CDF and PDF are different for different distribution of PU's activity. It is not convenient to analyze the complexity of the computation of the adaptive transmission time directly. Thus, to illustrate the cost of computing the adaptive transmission time, this article adopts the times of the iterations to approximate the complexity of the adaptive transmission scheme. The green line in Figure 10 illustrates the number of the iteration times for calculating one adaptive transmission time. It can be seen from this line that the iteration numbers decreases from 6.5 to 0.7 with the increase of the channel utilization from 0.1 to 0.9. Therefore, the cost of computing the adaptive transmission time is relatively small. In conclusion, the cost of the ICASST scheme declines with the increase of channel utilization. Besides, from Figures 4, 6, and 8, it can be concluded that the cost of ICASST scheme is directly proportional to the throughput of secondary system. Generally speaking, a conclusion can be drawn from Figure 10 that the cost of the ICASST scheme is relatively small compared with its efficiency. This article balanced the two conflicting goals in unslotted CR network by proposing a novel spectrum sensing and data transmission scheme. Relative analysis and simulation results validated that the proposed ICASST scheme simultaneously increased the throughput of sec-ondary system and reduced the unslotted interference. 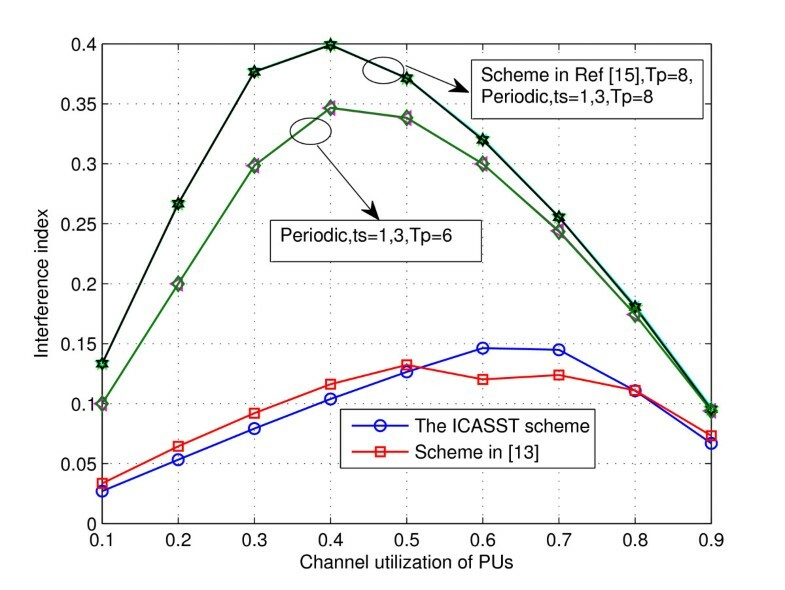 The efficiency of the ICASST scheme is due to releasing SU Tx from spectrum sensing and utilizing the statistic information of the PU's activity. Meanwhile, the efficiency was at the expense of computing the adaptive trans-mission time and sending the adaptive spectrum sensing time and spectrum sensing result. But as analyzed in Section 7, the cost of ICASST scheme was relatively small compared with its efficiency. In conclusion, this article proposed a novel scheme that significantly increased the throughput and reduced the unslotted interference simultaneously at the cost of limited computation and feedback. This research is supported by International Scientific and Technological Cooperation Pro-gram (2010DFA11060), China-EU International Scientific and Technological Cooperation Program (0902), and National Natural Science Foundation of China (61001119, 61027003).